Charles Dudley Warner (September 12, 1829 – October 20, 1900) was an American essayist, novelist, and friend of Mark Twain, with whom he co-authored the novel The Gilded Age: A Tale of Today. Warner was born of Puritan descent in Plainfield, Massachusetts. From the ages of six to fourteen he lived in Charlemont, Massachusetts, the scene of the experiences pictured in his study of childhood, Being a Boy (1877). He then moved to Cazenovia, New York, and in 1851 graduated from Hamilton College, Clinton, NY. 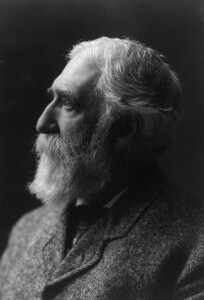 He worked with a surveying party in Missouri; studied law at the University of Pennsylvania; practiced in Chicago (1856–1860); was assistant editor (1860) and editor (1861–1867) of The Hartford Press, and after The Press was merged into The Hartford Courant, was co-editor with Joseph R Hawley; in 1884 he joined the editorial staff of Harper’s Magazine, for which he conducted The Editor’s Drawer until 1892, when he took charge of The Editor’s Study. He died in Hartford on October 20, 1900, and was interred at Cedar Hill Cemetery, with Mark Twain as a pall bearer.